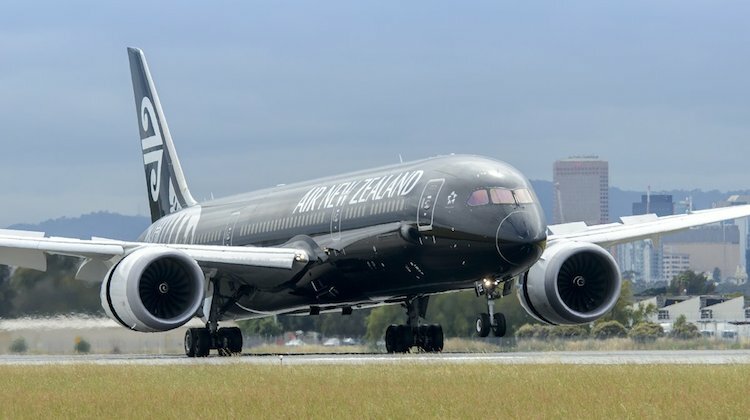 Air New Zealand will consider permanent deployment of the Boeing 787-9 Dreamliner between Auckland and Adelaide after assessing the performance of the aircraft, which started seasonal services on the route on Thursday. Flight NZ191, operated by ZK-NZE, landed at Adelaide Airport at 1030 local time on Thursday, about 10 minutes ahead of schedule, after a four-hour and 15-minute journey from Auckland. The aircraft was on the ground for abut 70 minutes before operating the reciprocal NZ192 back to Auckland. Air New Zealand, which began Airbus A320 services on the route about 10 years ago, is the first airline to introduce the Dreamliner to Adelaide Airport. The Dreamliner will operate three return services a week to Adelaide until March 25 2018 – supplemented with three A320 peak-season services between December 16 and January 27 – before reverting to six weekly A320 services. At a ceremony to mark the arrival Air New Zealand chief revenue officer Cam Wallace described the introduction of the Dreamliner as “a game-changer”, with passenger capacity to increase by 23 per cent and business class and premium economy to be offered on the route for the first time. It would also offer quick connections between Adelaide and the airline’s US, Canadian and South American ports. Wallace agreed the move to bring the Dreamliner to Adelaide during the high season was an experiment. However, he said, there were prospects for permanent services. “We will do an analysis of the performance during the next quarter, and consider our options then,” he told Australian Aviation. In assessing future operations, the airline would “need to get the balance right” between Dreamliner and A320 frequencies. Wallace said Air New Zealand had decided to bring the larger aircraft – with 18 business class, 21 premium economy and 263 economy seats – to Adelaide complete the Dreamliner’s Australian destinations and also to give South Australians the opportunity to connect with the airline’s long-haul destinations. Connections in Auckland to Honolulu, Houston, Los Angeles, San Francisco, Vancouver and Buenos Aires would be timely, and this would benefit air freight movement to North America as well as passengers. The widebodied Dreamliner was also “a very good aircraft for freight,” he said. This feature was emphasised by Adelaide Airport’s chief executive, Mark Young, who said the 787 services would increase freight capacity between Adelaide and Auckland by more than 25 per cent, assisting South Australian exporters to New Zealand and beyond. Passenger traffic between Adelaide and Auckland had been growing by about six per cent year on year and it was expected the advent of the Dreamliner on the route should bring further growth, Young added. SA Tourism Minister Leon Bignell, who travelled from Auckland on the inaugural flight, said the Dreamliner services would add 410 seats a week to the route, and provide international connections from North America to bring tourists and business travellers to Adelaide. Wallace said the Dreamliner had proved to be popular with passengers since introducing the aircraft to service in 2014, with the first Australian scheduled service operated between Auckland and Perth on September 14 in that year. Air New Zealand had a fleet of 10 Dreamliners, with another due for delivery before the end of 2017, he said. The aircraft will operate as NZ191 from Auckland to Adelaide on Wednesdays, Fridays and Sundays, departing at 0835 local tinme and arriving in Adelaide at 10.40 am. The return flight NZ192 takes off at 1155 for a 1825 arrival back in Auckland. AKL is a destination that should be operated by Qantas from Adelaide. It really is a shame that the National carrier has neglected ADL and International flights from Adelaide for so long. When the service was first announced it was for 3x weekly 789 year-round, supplemented with 2x A320 in the high season. Now it seems to be described as “experimental”. Is this significant? Over 70% loads on a 787 yet Qantas says there is no market for international flights from Adelaide! Hopefully this is the start of Air NZ services to smaller Australian cities. Canberra- Auckland must be on their radar along with Hobart services. Watch this space! @David ANZ would be seeking to use Auckland as a hub for its US services. If there was demand for Qantas international services that would be profitable, then Qantas would be flying from there. Its not a case of neglect per se, it just isn’t profitable. Why should the rest of the network subsidise international flights from Adelaide? Both Qantas and Jetstar used to fly from Adelaide – Auckland return. I’m guessing the demand wasn’t there ? @Craigy QANTAS has a shortage of aircraft to deploy on new international flights, its not a case of weather or not there are routes out of adelaide that can make money, there are plenty of untapped markets that will turn profits for airlines into adelaide. Qantas just seems to be more focused on the east coast and perth instead of adelaide. No big deal, it just means less competition and more money for the overseas airlines flocking to adelaide. At last, an airline in the Pacific that is actually profitable!! No wonder they left Virgin!!! What does that tell you! Qantas is probably waiting for Dreamliners before they service Adelaide and even Hobart. Adelaide is probably not profitable with the A330s. They’d need something with the capacity and range of the 767. The 787-8 has to be on the cards for qantas, even for flights to Melbourne and Sydney. Let alone somewhere like Hong Kong. @Arkair I doubt both those destinations. Canberra is served by Singapore into Wellington, and by Air NZ operating into there, they would hinder their alliance with both Singapore and Virgin Australia, Same can be said for Hobart. What I believe we will see, however, is new flights from Wellington, Christchurch, and Queenstown to place like Cairns, Gold Coast, and from Wellington possibly Perth. @Jackson , While yes Canberra is served by Singapore airlines into wellington their is still a chance of Air NZ (Or another airlines looking to do cross Tasman flights) doing Canberra – Auckland flights. theses flights could easily be done because , A) their is already likely demand for 2/3 flights per week between theses cities to start with tourism and business B) Air NZ (and many other Airlines) are keen to use Auckland as a hub to connect to America (North & South + Canada) which if theses flights where to happened and where timed right would create more demand for people using Cbr – Akl flights, C) The Singapore airlines flights between Canberra and Wellington are Point to Point flights while Cbr – Akl Flights would be Point to hub which would mean their is more demand. In fact, we are going to Singapore in a month using Singapore Airways’ direct flight for exactly this reason – the QF flights were cheaper and we are both QFFs, but the attraction of not going via Sydney was too much. @ Peter Exactly. People are quick to criticise Qantas for not providing international services out of Adelaide to Asia etc. But they forget that all these airlines fly to hubs so they are exploiting the onwards travel to other destinations. Something Qantas by enlarge can’t match. @ WIll. Its not so much a shortage of aircraft, its a case of generating the maximum revenue from routes it can serve profitably. If Adelaide presented such an opportunity, why isn’t it being serviced by even Jetstar? Virgin looked at Adelaide and the best it could come up with is a B738 to Bali. That should tell you something. @Craigy Firstly, the tigerair flights to bali weren’t cancelled because of demand those flights were sold out (thats backed up by the bitre and adelaide airport figures). It was the result of the Indonesian government not allowing tigerair flights to transport passengers to Indonesia with their current licence. Which is why they also stopped flying to perth and Melbourne. Your not suggesting there is no demand between melbourne and bali are you? Also your clearly not from Adelaide mate, because jetstar do fly to bali from Adelaide so make sure you know what your talking about first mate. Jackson is right re CBR-WLG. Sorry Arkair. The SQ CBR-WLG hub route is code shared with Air NZ. No need for CBR-AKL. Plenty of flights from SYD! QANTAS is an acronym! Please. Over there, are their aircraft. It might add credibility. Just trying to be helpful so don’t take offence. By the way, not that long ago Perth was bereft of QF Int’l services. But to be fair, QANTAS was going through a metamorphosis. I am a loyal QFF, however I can not understand why QANTAS does not think outside the square in terms of Trans Tasman market share. Again the management are asleep on this. The current timings into Christchurch from Sydney beggars belief, They could easily market a 3 times a week daily service between Brisbane and Wellington and why not offer an Adelaide to Christchurch seasonal service for the winter sports fraternity. In some situations it is a case of “Build and they will come”. Cairns to Wellington and Cairns to ChCh are also possibilities, why are the competitors able to get in first? From 2018, Air NZ will start taking delivery of 9 A320neo’s and 4 A321neos to replace the the existing international short haul A320’s. There is speculation, that the A321neo’s will be used to back up to existing B777/B789 Trans Tasman services ex AKL and currently A320 services CHC/SYD/CHC and CHC/MEL/CHC, The A321neo’s will carry 214 passengers in 1 class with an ‘enhance’ Works Deluxe’ product for premium customers. Later this year, Air NZ will take delivery of B789 no 11 with enhance premium product and early 2018 B789 no 11 with enhance premium product and B789 no 13 early 2019. With the arrival B789 no 11, it will free up a current B789 which could be used for daily AKL/ADL/AKL services backed up with A321 for high peak seasonal services. @Geoff – Air NZ does not have a codeshare agreement with SQ on the CBR/WLG/CBR sector only of the SIN/WLG/SIN sector. VA has a codeshare agreement with SQ on the CBR/WLG/CBR sector. Wellington has been the fastest growing airport in term of Int’l traffic with similar pax numbers to Adelaide. Queenstown has just taken the mantle. The point being that the central New Zealand market would support your ideas D W Bell. I have 2 trips booked coming up from Brisbane to Wellington on Virgin can’t understand why Qantas don’t have a plane on this route as virgin are always full. Just returned from Singapore on a Qantas 330 really great plane , I make sure I book the 330 to and from Perth once a month as the 737 is not much fun over that distance. Regarding Cairns its very seasonal market even the AKL-CNS route is no longer year round. Can’t see WLG and CHC to CNS ever those passengers need to help fill the AKL-CNS flights. Regarding Canberra and Hobart non stop to AKL is not going to happen those two cities are best served through the existing NZ/VA codeshare as it allows multiple daily connections via the main gateways of BNE/SYD?MEL. Qantas is no longer an acronym. Sorry Roger. QANTAS is and always will be. @ Will I suggest you re-read my comment. I made no comment about the cancelling of the Bali flights by the Virgin Group. My point was that the only route Virgin could come up with out of Adelaide that was likely to be profitable was Bali. I didn’t know Jetstar flew to Bali as well but it doesn’t change my point. As for your manners – well I will leave that alone for now. And no I don’t live in Adelaide or South Australia thankfully. Oh no! Not another 787-9 “game changer”. Can’t these senior execs be a little more original? After all, they’re paid enough to be so. As for the CBR-AKL debate, you have to realise that CBR is now a city of 400,000+ very well-heeled travellers (not to mention the surrounding catchment area), who like to do a lot of international travel and would willingly pay a premium for having to avoid the cramped Dash 8/ATR 72 hop to SYD and the terrible bus trip across to Iinternational to make their o’seas connections. I can’t fathom why ANZ, QF, VA and others haven’t sought to exploit the CBR International connection now that it is available! Public servants’ taxpayer-funded travel alone would seem to justify it.